The Sin Bin Sports Blog: Is It Time To Panic In Vancouver? Is It Time To Panic In Vancouver? Earlier, the Canucks found themselves skating off their home ice after losing to the St. Louis Blues 3-0, the third time the Canucks have been shutout this season. The '11-'12 season, although young, has presented quite a problem for the defending Western Conference champs. The Vancouver Canucks have played 10 games and currently sit in 10th place in the Western Conference, with a 4-5-1 record. The face of the franchise, Roberto Luongo, has a 2-3-1 record, 3.45 goals against average, and save percentage of .868 in six starts. The team has a goals for, goals against differential of minus-5, compared to the plus-77 they finished last season with. Fans in Vancouver have booed Luongo out of his crease five times in the six games he has started.There are rumblings about trading Luongo, things that dont usually happen until a playoff let down, and the Canucks look far from the Presidents Trophy team they were last season. But the Canucks' faithful should not panic quite yet. At the 10 game mark of last season, the Canucks were in a very similar position with a 5-4-1 record, and did not seem to hit their stride until after the 30 game marker. The Canucks won 38 of their 54 wins after the 30 game threshold last season. Below is a break down of the Canucks '10-'11 season in 10 game increments. 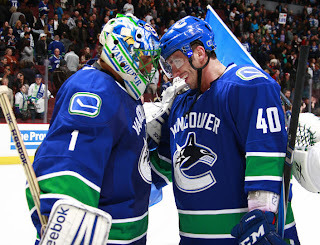 The Canucks should rebound from this slow start, they did last year. Twin forwards, Henrik and Daniel Sedin, aren't having trouble finding the back of the net. The twins lead the team in points with 11 and 12 points respectively. The duo of Luongo and Cory Schneider will eventually shake off their early season rust and return to their elite form, becoming Vancouver's saviors once again. Canucks fans should give their team a few more weeks before they start contemplating a jump to Calgary or Edmonton.